No Show and Cancellation prior to 24 hours before arrival will result in a fee equal to the price of one night. 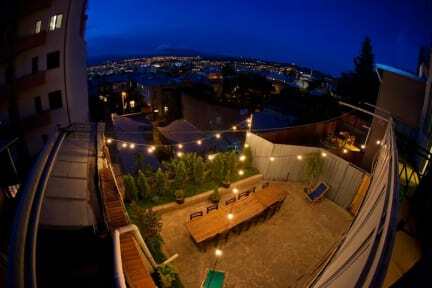 If you are looking for an authentic Tbilisi experience, then Mountain 13 is perfect for you. The hostel building is a historic house that used to be an Embassy of France. We have 5 different kinds of rooms for you to choose from on the second floor, while the first floor is for hanging out and relaxing and includes a spacious common room, a fully equipped kitchen (free tea/coffee and cooking supplies), a dining room and a secluded terrace with an amazing view over Tbilisi. 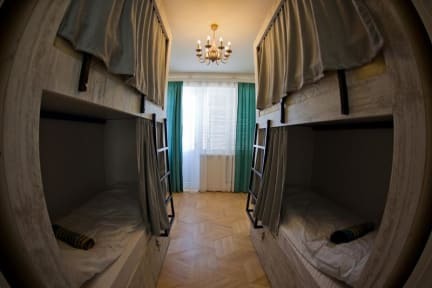 Privacy is not an issue as the dorms have extra-large custom bunk beds which can be closed off completely with a curtain and include a power outlet and a light. Mountain 13 is in a great location. Vera is the favorite neighborhood of many residents, while Gogebashvili street being one of the best streets to live in the city. Just a couple of minutes walk will take you to Chovelidze street where you can experience this revigorated historic street, now with cool bars, cafes and restaurants, as well as interesting people. In another direction, you can quickly arrive at Rustaveli Avenue, the central avenue of Tbilisi, which is perfect for a nice walk and admiring architecture. Also close by is the historic Mtatsminda funicular, which will take you on top of the highest hill in Tbilisi where you can enjoy Mtatsminda Park and a breathtaking view from a Ferris wheel.